To get insight into both the political and social applications of recycling it is important to look at how local councils are creating and devising policy and putting that policy into practise in their boroughs. Local Councils across the UK have been working out how to respond to Government and European Directives that set national recycling targets. For some Councils, these directives have come as a shock and as a wake-up call if their recycling and waste policies have been limited. For other, rather more enlightened and greener Councils, the directives have been a guideline that they can set against their own more advanced strategy. To give an example of these differences in attitudes, here is a comparison between two London Councils. Of the two, Richmond is a more affluent area, and Barnet has comparatively more residents. Barnet launched its recycling policy in 2004. It had a radical agenda: householders who failed to participate in its compulsory black box scheme - putting paper, glass bottles etc in the fortnightly black box for collection, would be fined 1000. This only applies to residents of houses, not flats, and no set amount of recycling materials per household or per box is stipulated. Those householders who are “deliberately and persistently” failing to use their black box will face action. This ran as a pilot scheme for a year, using 25,000 houses carefully selected. Street enforcement officers monitored the scheme, encouraging and cajoling householders, and after a year the Council had achieved an 18% improvement in recycling. This was seen as justification for the scheme, and it was then widened to include the whole borough, incorporating 113,000 households. The scheme is monitored by DEFRA (Department for environment, food and rural affairs), and has been considered for implementation by many other Councils across the UK. 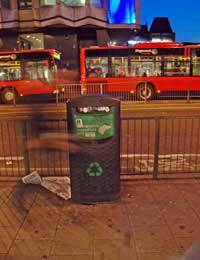 As of 2006, Barnet Council had served just one legal notice against a resident who had been consistently failing to recycle, despite encouragement and eventual warnings. The Council were preparing to make a case using section 46 of the Environmental Protection Act of 1990. Richmond Council rose to the Government directives in a number of different ways. They identified that in the year 2004/05 the area produced approximately 123,000 tonnes of municipal waste, of which 86,000 tonnes of was household waste. Of this, 18% was recycled, and 6% was composted. In addressing these figures and formulating new recycling and waste disposal strategy up to 2020, Richmond Council has developed target reductions for waste disposal, and increased expectation figures for recycling. Through additional outside agencies in the borough that are being employed to assist the Council with these specialised aims, the Council is promoting home composting, the use of reusable nappies, community reuse, and waste reduction in schools and businesses. In addition the Council aims to serve all households in the borough with recycling collections of at least four materials by 2008. It is focusing on paper, glass and can collection for recycling in the estates within its area. The policies of these two Councils differ between the more draconian carrot and stick attitude of Barnet, and the softer, educate and inform ideals exemplified by Richmond Council. Both are responding to the same targets, set outwit their control. Both are clearly aware of the environmental as well as the economic need to recycle waste materials. Both Councils will also be responding to pressure and influence from within their constituency of residents. It is worth watching to see how they both perform in the long term. Hopefully they will both achieve 100% waste reduction and recycling by 2020, instead of the modest 30% they are aiming at. May both these policies work!